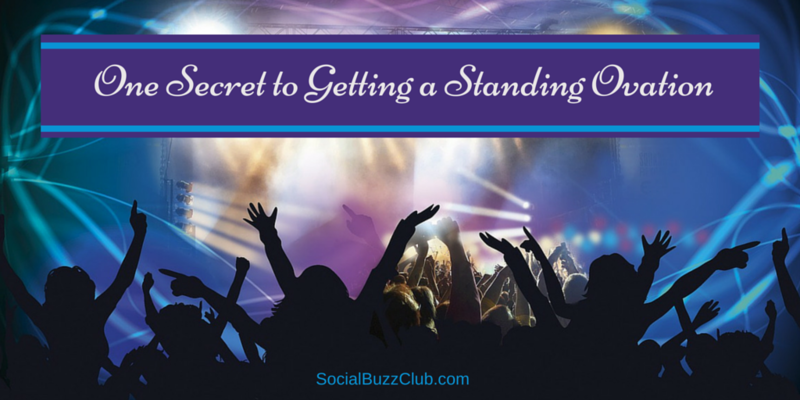 When we talk about getting a standing ovation, however, we’re looking at taking speaking to an entirely new level. Because if a crowd feels compelled to jump to their feet, this means that your audience LOVES you. Your audience, no matter who they are, wants to be impacted and inspired. However, you have to impact your audience in the right way. Here are 3 key pointers. 1. Listen. To have the best impact, you need to really tune into your audience. Who are they? What do they care about? And even more importantly, deeply listen to your audience while you’re speaking. View it as a 2-way conversation, even if you’re the only one talking! 2. Be willing to be vulnerable. Oftentimes, it’s the stories we’re most reluctant to share – painful or difficult moments from our lives – that inspire our audiences. Far more than just another “3 secrets to…” list of tips. 3. Speak to inspire. If you’re selling your services or products, you of course want to inspire the right people to work with you. But if you have a greater intention – such as to inspire them in their lives in general – they’ll both feel your generosity, and it’ll heighten your emotional connection with them. You also need to know how to structure your talk so that is has a dramatic build… as well as the type of content to include that will be inspiring. In summary, choose to be an inspirational presence in the world. Decide you want to change people’s lives. Know whom you’re talking to, and deeply listen. And, as hard as it can be at times, share your heart. While there’s more to learn, those are the first steps… to having your audience leap to their feet. Jonathan Bender is the founder of WholeSpeak, LLC, Connection Jams™ and The Performance of Your Life ™. He trains and certifies coaches in The WholeSpeak Method, and is known worldwide for bringing authenticity, growth empowerment and performance training into speaking and life. More at www.WholeSpeak.com. This entry was posted in Business & Personal Skills, General Buzz, Public Speaking and tagged how to become a professional speaker, inspiration, professional speaking, public speaking, speaker coach. Bookmark the permalink.